Before there was Jeff Bezos and Amazon there was Sam Walton and Walmart. The Walmart founder, who died in 1992 at the age of 74, lived one of the most incredible business success stories of all time. He single-handedly invented the concept of a large discount chain store and proved that these stores could not only survive, but thrive in rural areas far away from major cities. For decades the company had a seemingly unbreakable record of extremely fast growth and profits. And thanks to those profits, Sam Walton became extremely wealthy. Sam was born on March 29, 1918. That means today, March 29, 2018, would have been his 100th birthday. So, how rich would Sam Walton be today if he was still alive? Sam opened the first Walmart in 1962, when he was 44 years old. His concept was simple. He bought a wide variety of products in bulk across his network of stores so he could pass savings on to his customers. High volume, low prices. He concentrated on selling American-made goods and he treated his customers very well. Walton rose every morning at 4:30 am and never gave into a lavish lifestyle despite a growing enormous fortune. He drove a beat up old truck and lived in the same modest home from the 1950s until his death. When he traveled for work, he flew coach and either stayed in cheap motels or spent the night in one of his managers' guest rooms. Walmart went public on October 1st, 1970 at a total valuation of $150 million. From 1981 to 1991, the shares produced a staggering average annual return of 47%. A $1000 investment in Walmart the day it went public would be worth $1.1 million today. And that's not counting Walmart's generous annual dividend which would have compounded even more! 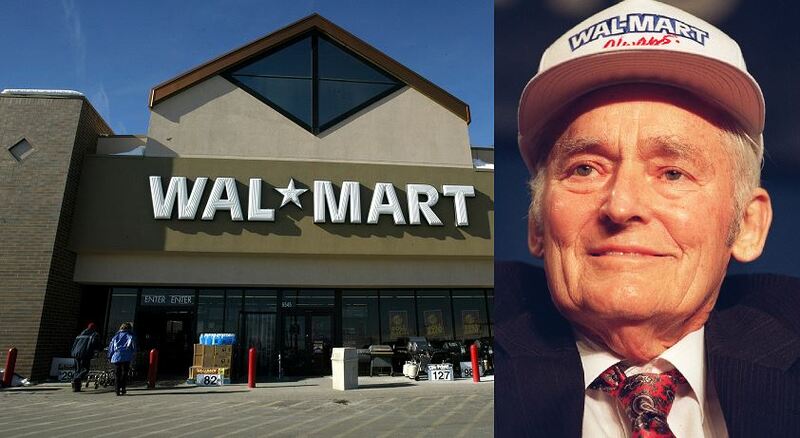 At the time of his death in 1992, Walmart's market cap was $45 billion. Today the company's market cap is $260 billion. Up until very recently, it was $300 billion. Exactly How Rich Was Sam Walton? In 1985, Forbes magazine proclaimed that Sam Walton was the richest person in the world, a title he hated. At the time, Forbes estimated his net worth at $2.8 billion, which is the same as $6.5 billion today. Think about that. Just 30 years ago, to be the richest person on the planet you "only" needed $3 billion. After the magazine came out, customers and employees started asking Sam to autograph dollar bills, a tradition he strongly disliked but obliged. Side note: Technically, the only reason Walton was able to be the richest person on the planet in 1985 was because a year prior Getty oil billionaire, Gordon Getty, broke his $4.1 billion fortune up with several family and philanthropic trusts that left him with a personal net worth of "just" $950 million. At the time of his death in 1992, from two types of cancer, Sam Walton had a personal net worth of $8.6 billion. That's the same as $15 billion today. He split his fortune evenly among his four children Rob, John, Jim and Alice. John tragically died in a plane crash in 2005 and left the majority of his wealth to his son Lukas and another chunk to widow Christy. If Sam Walton were alive today, first off, happy 100th birthday, and secondly congrats on still being the richest person in the world! If Sam Walton were still alive, his personal net worth would $150 BILLION. That's the combined wealth of his children plus dividends and the fact that a large chunk would not have been removed as an estate tax yet. As of this writing, the richest person who is actually alive today is Jeff Bezos who is worth $119 billion, $31 billion less than Sam. It gets better. If he were alive today, every year, Sam Walton would be entitled to a $500 million dividend payout thanks to his massive stake in the company. Today that dividend is split four ways. "All of that hullabaloo about somebody's net worth is just stupid and it's made my life a lot more complex."